If you wear your emotions on your sleeves, the Maserati GranTurismo will have you rolling them up and taking to the open road. The Audi R8, Jaguar XKR and Mercedes-Benz CL550 may offer more servicing dealers, but they lack the uniquely Italian vivaciousness of this gorgeous 2+2 GT. The 2012 GranTurismo is not a car for the faint of heart or the risk-averse, especially if you live in an area that doesn't have a Mediterranean climate. You won't find it topping the J.D. Power quality charts or a recommended buy by Consumer Reports. And Spock wouldn't find the GranTurismo to be "logical." Maserati bolsters the 2012 GranTurismo line with two new models: the Convertible Sport and race-inspired MC Coupe. Both are equipped with the higher-output 444-hp V8 engine and paddle-shifted ZF 6-speed automatic transmission. All 2012 GranTurismo coupes and convertibles offer 2+2 seating that's essentially two pairs of buckets, each with its own console. An easy-access feature powers the front seats forward to gain admission to the rear. All GranTurismos have extensive leather trim, with the MC model adding Alcantara accents to the console, door panels and dash. The triple-insulated canvas convertible top deploys in just 24 seconds, and will do so on the run up to 20 mph. Two golf bags stash in the trunk. The Maserati GranTurismo Convertible features rear rollover bars that pop up, protecting interior occupants in a crash. The Maserati GranTurismo's bodywork is form-fitting and low-slung. A long, curvaceous hood, prominent oval grille and triple air vents on each front fender create a classic visage. All 2012 GranTurismo Coupe and Convertible models roll on big, 20-inch alloy wheels which dominate the car's aggressive profile. The ultra-high-performance GranTurismo MC Coupe has bodywork inspired by the racing Stradale, employing a wider front spoiler and rear diffuser to make the car more stable at speed. The MC's side skirts have brake cooling slots and the hood sports two vents to help cool the engine. Just like the racer, the MC's center-exit exhaust is all-business. Not only does the GranTurismo look marvelous, it makes you feel marvelous on the road as well. The chassis is superbly balanced with nearly equal weight distribution front to rear. The S Coupe, Convertible and Convertible Sport feature an electronically controlled Skyhook adaptive suspension that continuously adjusts ride firmness to maintain optimum handling control and ride comfort regardless of the road surface, while the all-new MC Coupe rolls on a lowered suspension with fixed-rate shocks and stiffer springs and stabilizer bars for more spirited high-performance driving. All 2012 Maserati Turismo models roll on road-hugging wide-aspect 20-inch alloy wheels. Race-inspired 4-wheel anti-lock Brembo brakes with vented and cross-drilled rotors provide powerful and confidence-inspiring stopping ability. As depreciating assets go the GranTurismo is about as self-indulgent as they come. There is no logical reason to buy one, but what the heck, life is short. From the "base" $123,000 GranTurismo S Coupe and $137,000 GranTurismo Convertible to the race-inspired $139,000 GranTurismo MC Coupe and $142,000 GranTurismo Convertible Sport, Maserati has a wide selection of 4-seaters available. With a heavy load of personalization options, the sticker can rise to the $160,000 range and higher. What the GranTurismo has going for it is character and passion. It's a little old-school compared to the Audi R8, and less technology-laden than the BMW 650, Mercedes CL550 and Jaguar XKR. Resale value should hold up better than the larger Maserati Quattroporte sedan, however, there are fewer servicing dealers compared to other premium brands. Don't forget to research the kbb.com Fair Purchase Price before committing to a deal. Present and accounted for are features you'd expect a $130,000 sports-luxury ride to have like navigation (7-inch screen), extensive leather trim, heated, power front seats with memory, a Bose surround-sound audio system with satellite radio and Bluetooth/iPod integration, a hard drive to store music, rear parking sensors, and rain-sensing wipers. On the convertible Gran Turismos, the A/C settings adjust automatically based on whether the top is up or down. The Convertible Sport model has standard drilled aluminum pedals. Maserati is big enough to have access to the Fiat and Ferrari parts bins, yet small enough to be a master of personalization, with the ability to allow each buyer to have a custom-made car. For example, the convertible top comes in six colors. Leathers are available in a large variety of colors. The dashboard, door panels and rear panel can be done in black chrome, various lacquers or exotic woods like moonwood and Carbalho. There are even six colors for the brake calipers. The MC Coupe is available with exterior carbon-fiber accents. Convertibles can be optioned with a wind-stop screen installed between the front and rear seats that reduces turbulence with the top down. What you can't get in a GranTurismo are high-tech options like night vision, a head-up instrument display, or dynamic cruise control. As if the 2012 Maserati GranTurismo wasn't sporty enough, push a dash-mounted "Sport" button and the exhaust song becomes more intense, shifts get quicker and on all but the MC model, and the Skyhook electronic adjustable suspension delivers a firmer ride and sharper handling. Even the shift paddles for the 2012 GranTurismo's 6-speed automatic transmission embody the same artistic flair and bold design as the rest of the car. The long, racing-style paddles are made of light alloy and provide tactile manual shift control that enhances the driving experience. The heart and soul of this Maserati is its melodic, highly spirited 4.7-liter V8 co-developed with Ferrari. In the GranTurismo S Coupe and base Convertible, it develops an attention-getting 433 horsepower. The GranTurismo Convertible Sport and MC Coupe run with a more highly-tuned 444-horsepower version of this engine. Neither version is particularly fuel-efficient, but each is a model of smoothness and responsiveness. The engine's song becomes even more intoxicating in Sport mode, where an exhaust-system bypass valve can be opened for a more intense engine sound above 3,000 rpm. The GranTurismo's standard automatic transmission's operating modes include a Sport mode for quicker shifts, a Manual setting for full manual gear selection via steering column-mounted paddle shifters, and Ice mode for low-grip situations where the transmission starts out in 2nd gear. With slinky Pininfarina-penned bodywork outside, butter-soft Poltrina Frau leather inside, a free-breathing Ferrari-inspired V8 under the hood, and smart, programmable modes in the suspension and transmission, the 2012 Maserati GranTurismo has the body, brawn and brains to tickle anyone's exotic-car fancy. And in the exclusive world of exotics, the new GranTurismo is a relative bargain, selling for some $60K less than an Aston Martin DB9, Bentley Continental or Ferrari California. It's neither the fastest nor the most technologically advanced GT, but any car buyer with a pulse cannot deny the GranTurismo's pheromone-inducing presence. For 2012, Maserati offers two coupes (S and MC) and two ragtops (Convertible and Convertible Sport), each unabashed driver's cars, but with surprisingly generous rear-seat room too. 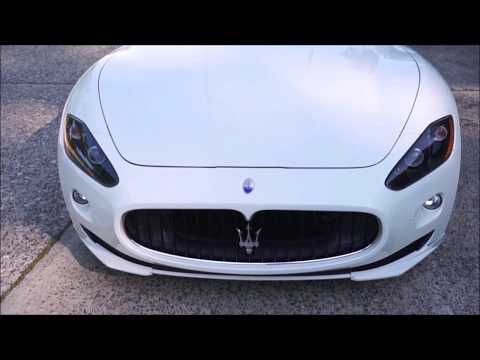 2012 Maserati GranTurismo S Review - Does it Drive as Good as it Sounds ?